We would like to inform you about how to use Discount Tickets acquired from the Avatar Collection System. If you have purchased a Summer SWAG package, you will be able to use the Discount Ticket( ) obtained from the package when you purchase an Empyrean Admiral package. Please see below for steps on how to use the coupon. As shown below, a Sales Coupon button can be found when you purchase a package. By clicking on the button, you can open the Coupon Book. You may only get a discount for one package at a time. Products other than a package are not eligible for a discount. 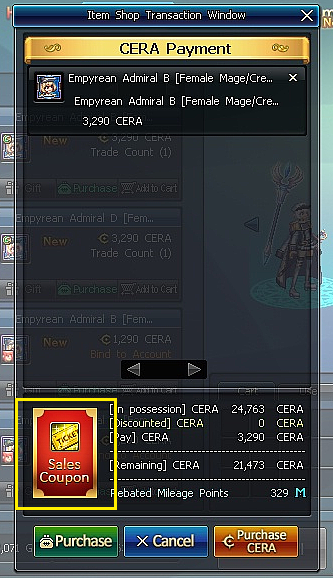 Discount Ticket acquired from purchasing an Empyrean Admiral package can be used when purchasing the next sales package. 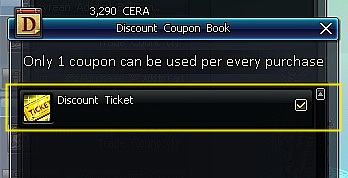 When you open the Coupon Book, a list of coupons you can use will be displayed. To apply a coupon, check the box to the right of the coupon you wish to use. Once the coupon has been applied, the discounted amount and the total price will be displayed. Mileage point will be given based on the total price after the discount has been applied. Coupon will not be consumed until the payment has been completed and CERA has been deducted from your account. If you have any questions regarding the coupon system, please send us an inquiry at https://neople.zendesk.com/hc/en-us/requests/new.